After what reportedly turned into a lost weekend in Arizona, it looks like Cleveland Browns owner Jimmy Haslam is learning some hard truths about the NFL, mainly that a fat wallet is no guarantee of success and that this whole ownership thing may be harder than it looks. And Browns fans, once again, are left to wonder why, exactly, it is going to be different this time. According to ESPN’s Chris Mortensen (and others), Haslam and Browns CEO Joe Banner are returning to Cleveland empty-handed after putting all their chips in on an attempt to hire Oregon coach Chip Kelly. After reportedly meeting with Kelly on Friday, Haslam and Banner sat around Saturday night, picking at the basket of rolls, while they waited for a dinner meeting with Kelly that never happened. Apparently the opportunity is not as spectacular as Banner thought, at least not to Kelly. Of course, some of this falls on Kelly as well, as it is starting to look like, for the second year in a row, he is just flirting with NFL teams before returning to his comfort zone at Oregon (and Phil Knight’s own fat wallet). And no matter what Haslam and Banner promised him, you can’t force someone to accept a job. But for the first major move under Haslam, the failed attempt doesn’t look good. Just like every other time the Browns have changed regimes, fans were promised that this time was different only to find out that, for now, things are every bit the same as always. Like we wrote back in October, the fact that Haslam is not Randy Lerner doesn’t guarantee that things will change for the better. As disappointing as the news is to some Browns fans, it’s not the end of the world. While they are clearly not going to get their top choice – no matter how the team tries to spin it – there is still the possibility they will hire a competent NFL coach. (Did you hear that Marc Trestman’s Montreal team is the New England Patriots of the CFL? Maybe one day, when the Cavs need a coach, they can hire the person in charge of the team that is the Los Angeles Lakers of the Turkish League). And if they like the way Kelly’s offense operates at Oregon, there’s nothing stopping the Browns from incorporating parts of the offense into their playbook the way other NFL teams have done. So no need to fold the franchise just yet. We can pretty much guarantee that someone will be coaching the Browns next season – it’s still just a question of who. 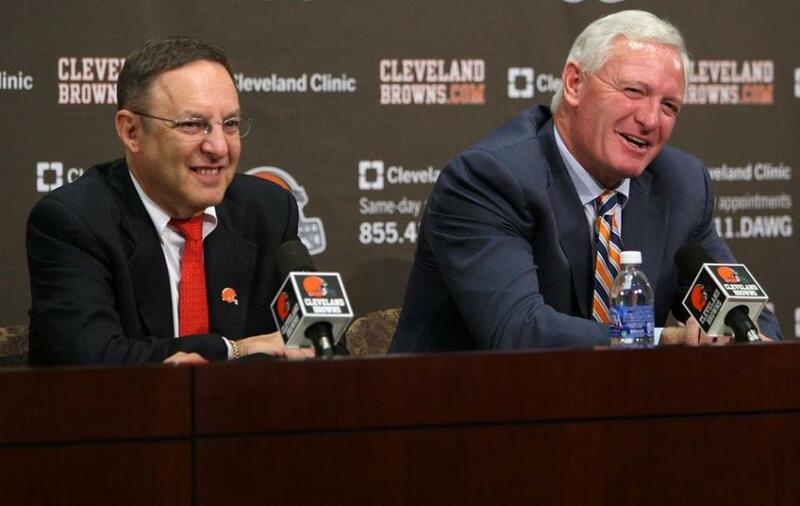 And don’t forget – the Browns have a plan, so nothing can go wrong, right? Of course, executing the plan is just as important as creating a plan. The best thing to come out of the weekend may be the crash course that Haslam received on what the NFL is truly about. Hiring a coach and running a franchise isn’t the same as opening a truck stop in the sticks of America; it takes more than a Southern drawl and a fat wallet. (If that wasn’t true, then Jerry Jones would have to build an extension on Cowboys Stadium for all his Super Bowl trophies). Next time you are going to schedule an interview with a coaching candidate, it may be a good idea to make it over breakfast.